Poll: 4 of 5 Americans strongly support prohibiting insurers from charging women more than men. A majority of the public is skeptical the Republican health plan would be an improvement over the Affordable Care Act, with widespread concerns that insurance costs would increase while people lost coverage, according to a poll released Wednesday. The dour public assessment, from interviews with 1,206 adults conducted March 6-12, came before the Congressional Budget Office released its projections on Monday. The nonpartisan budget analysts predicted that the GOP's American Health Care Act would leave 24 million people without insurance as it retracted Medicaid coverage for the poor and made premiums too high for many older people to afford. The public doubted pledges from President Donald Trump and Republicans that the proposal would lower the costs of coverage for people who buy their own insurance. Forty-eight percent thought policies would become more expensive, while 23% thought they would drop. The rest thought insurance costs would stay the same. People were also dubious that deductibles would get smaller: Only a quarter of people thought so. Respondents also were doubtful the GOP plan would be a boon even for the wealthy. About the same number of people expected the plan would increase costs for high-income people as those expecting a decrease. For all the suspicion about the GOP approach, the public remained ambivalent about the ACA, with 49% supportive and 44% opposed. The public was also split about whether the ACA should be repealed. Republicans, not surprisingly, were more optimistic than Democrats that the GOP plan would have positive effects. But it was not unanimous: 1 in 5 thought their party's plan would lead to fewer people with insurance. 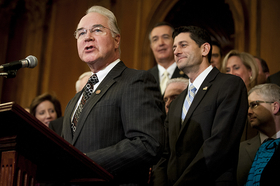 A fifth of Republicans also said they expected insurance costs to rise under the plan. Provisions of the GOP plan that would change women's healthcare have strong opposition, including its ban on federal funds for Planned Parenthood to help it provide birth control and other non-abortion care to lower-income people. Three-quarters of the public thought Medicaid should continue to fund Planned Parenthood's non-abortion services. The law already prohibits Medicaid spending for abortion, but the pollsters found that only a third of the public is aware of that. The poll reported that 4 of 5 Americans strongly support provisions in the ACA that prohibit private insurers from denying coverage to pregnant women and from charging women more than men for policies, as well as those that require mammograms and cervical cancer screenings be provided with no out-of-pocket costs. Nine of 10 Americans support the ACA's requirement that insurers pay for maternity care. The poll's margin of error was +/- 3 percent.